Regular readers of my blog will note that I’ve been on a quest to achieve a good sourdough for years. First I had seemingly insurmountable issues just getting a starter going. Eventually though I managed to get a culture going. Next, I had challenges getting a bread going that would rise. 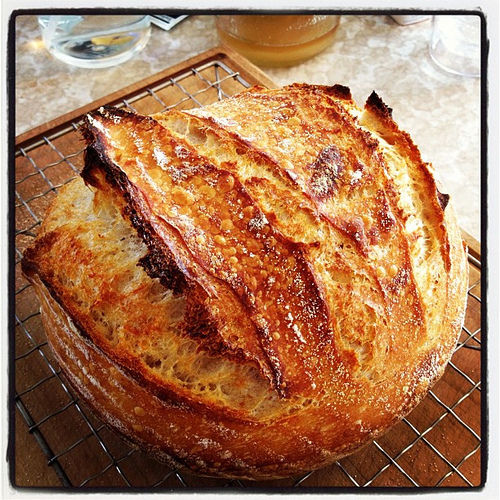 I followed numerous recipes and read up on the advice of bread guru Peter Reinhart. Eventually I came across the book Tartine Bread by Chad Robertson, and his advice to use a Dutch oven to achieve the beautiful caramelized crust that is characteristic of artisanal bread. And despite having beautiful looking bread, it lacked any real sourness. I took a hiatus from baking bread for a long time this year, neglecting my starter in the fridge until it turned into a dark, smelly science project funk with a thick layer of hooch on top. But as fall geared up I felt inspired to try again, so over a couple weeks I woke up my starter, feeding it a few times before using it to see if it was even still viable. I’d read it was next to impossible to kill one once you had it going, so long as you kept it in the fridge. And low and behold, it was still very much alive. Making this kind of bread is a weekend-long project. I start by making the leaven overnight on Friday night. Then on Saturday I make the dough and set it up for its first ferment stage. It’s a high moisture dough, so kneading isn’t necessary exactly but the dough needs to be turned several times while it does this first ferment stage. Then the dough is “cupped and seamed” on the counter as a means to develop surface tension on the dough, and finally, a couple of stretch-and-folds before it goes into a brotform for its final rise. And here is where I’ve come to a revelation. The instructions I’ve followed from Chat Robertson’s book call for 3 to 4 hours at room temperature, or, you can retard the rise by putting the bread into the fridge for 8 to 12 hours, which is what I’d been doing. But a couple weeks ago I decided to try leaving it out overnight on the counter instead of putting it in the fridge. The final rise is when all the flavour develops, and suddenly, I have the most flavourful bread I could imagine. It’s not only beautiful now, it’s sour and mouthwatering. I’ve been making it every weekend and its our new Sunday morning ritual. Speaking of which, I think this loaf is cool enough to cut now. Bye! beautiful! and there is nothing better than fresh bread, still warm from the oven. Experimentation is the best thing in the kitchen, isn’t it? Wow!!! That crust is unbelievable!